1930 Risby Bros. 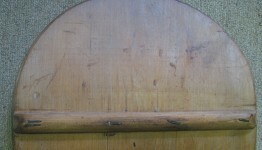 Solid Wood Belly Board 3ft 6"
MANUFACTURER: Risby Bros., Elizabeth Street, Hobart. Huon pine board, steamed nose rocker, 1'' rounded timber cross cleats fixed with nails, tail hole and bronze plate. Possibly originally stained or varnished. Tail: rounded square with hole for hanging storage. Bottom: flat with two cross cleats. Image right : Tail cleat and hole. Deck: Risby Bros.Ltd., Elizabeth Street, Hobart - bronze plate at sweet spot. Image right. Deck: natural timber. Possibly originally stained or varnished. This design was popular in the first half of the 20th century in the southern states of Australia and in New Zealand, South Africa and UK. Hence the descriptive name, (British) Empire boards. Dimensions and photographs Australian Surf Museum, Manly Suf Life Saving Club, 23 November 2007. Thanks to Ray Moran, Ray Petersen and and Manly Suf Life Saving Club. Australian Surf Museum Catalogue (2006) No. 55 . The board is on-loan from Dave Montgomery, Balgowlah, NSW. "The board was purchased from an elderly resident of Belrieve, Tasmania circa 1997. Built of huon pine, the nose lift was set by steaming the timber ande bending it over a metal pole. 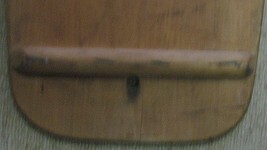 The hole in the tail is original and allowed the board to be hung flat against a wall after use for drying and to decrease the possibility of the timber warping. 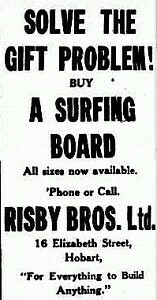 The owner purchased the board new and had several black and white photographs illustrating the boards in use. This was in signficantly sized waves, large and powerful enough for some riders to ride in a standing position." - Dave Montgomery in phone conversation, November 2007. Many thanks to Dave for his assistance. Risby Bros. was a timber milling company established in 1844 in Tasmania who expanded into a range of associated industries including hardware supplies, furniture manufacture and ship building. Between 1848-1894, they built Spy (a cargo schooner), Nellie (a cargo ketch) and a number of whaleboats. - The Mercury (Hobart), Saturday 21 December 1929, page 3. In early 1938, they moved premises from their Elizabeth Street store to a new location in Collins Street, Hobart. Owing to Removal from Present Site, Our Entire Stock MUST Be Cleared! 20 SURFING BOARDS, in Huon Pine, shaped and cleated, with curved ends, at .... 12/6 each. - The Mercury (Hobart), Saturday 8 January 1938, page 9. 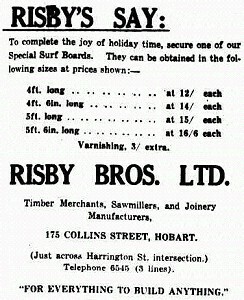 At the Collins Street store the range of board sizes were specified from 4 to 5ft 6'', with an addition fee for varnishing. 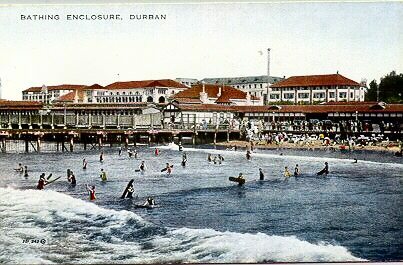 The previuous "surfing boards" was now shortened to "surf boards". - The Mercury (Hobart), Saturday 14 January 1939, page 22. 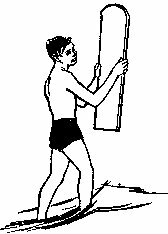 Circa 400, the Paipo developed as small wooden prone board, used thoughout the Pacific Islands primarily as juvenile sport. In Tahiti and Hawaii the boards were ridden prone, kneeling and, occassionally, standing. Dimensions ranged from 3 feet x 12 inches (the smallest example in the Bishop Museum, Honolulu Catalogue Number :C.5966) to 6 feet x 9 inch boards in Aotearoa (New Zealand). can raise his head to breathe above the surface of the foam." Steedman: Manual of Swimming (1867), page 268. Solid timber handboards/bellyboards were in use on Sydney's beaches before the visit of Duke Kahanamoku in 1914. "The surf-board is used to a great ,advantage on flat, shallow beaches. The rounded end is to the front when shooting." Baker: General Physical Culture (1910) pages 58-59. The enthusiasm generated by Kahanamoku's visit saw Sydney surfers persue the developement of the standing board and prone craft were dominated by the Surf-o-plane, circa 1933. 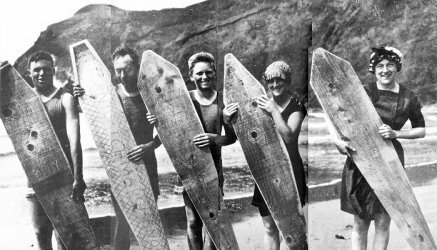 These prone boards were in Victorian use as early as 1915, by a Mr. Jackson and Mr. Goldie at Point Lonsdale, after a visit to Hawaii. 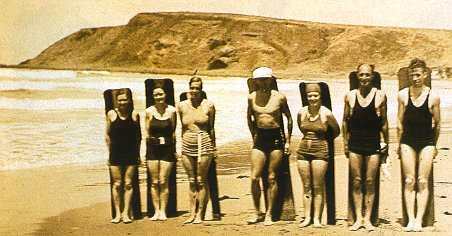 "Surfing arrived in Tasmania in the second half of the 1920s, although no clubs were formed until after the Second World War. The man credited with bringing surfing to Tasmania is Harvie Thompson, who came to Hobart in 1926, having grown up and learned to surf at Manley (sic), NSW. Thompson soon befriended a local, Cedric Cane, and the two men became central to a project that subdivided and sold land behind Clifton Beach, near Cremorne. Only eighteen blocks were sold before the Second World War, but by then a small, tight-knit community of shack dwellers had developed. Their summer activities included swimming, fishing, flounder spearing and surfing. Men, women and children surfed. Their boards were entirely homemade from the pine sides of kerosene boxes, sawn up second-hand tables or any planks of suitable size. During the 1930s they obtained more sophisticated commercially produced plywood boards with upraised forward ends. Harvie Thompson's much-prized board was fashioned from cedar. Most, if not all, boards were hand-painted with marine motifs." Young, David: Sporting Island - A History of Sport and Recreation in Tasmania., pages 205 and 206. 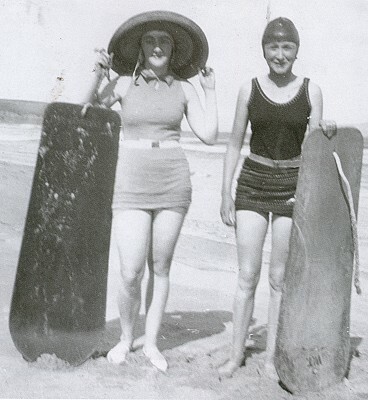 "Female surfers on Clifton beach in the 1920s. Note the holes and ropes at the tail of these boards to allow the boards to be hung to dry after use as described in the account by Dave Montgomery, above. Furthermore, the board on the left is wide enough to conceivably be ridden in a standing position. The design was popular in the southern states of Australia and in New Zealand, South Africa and UK. Hence the descriptive name, Empire boards. Although many were probably home made, this and several New Zealand examples were probably factory made - note regular shape, nose lift and paint decor. Geoff Cater (2007-2013) : Catalogue : Risby Empire Board , #335.